Parked up at the carpark next the footbridge at Baravore T066942 G. Crossed the Avonbeg River via the footbridge. Contuined along the gravel track which leads up to the an oige youth hostel and shortly afterwards we took the track which bears left (contuining on the original track will take you further into the Glenmalur valley). Followed this forest track right around into Fraughan Glen where the views really open out in front of you. The entire track is not clearly identified on Sheet 56 but it will take you deep into the glen and only really peters out at the back wall of the glen - at this point another faint track can be picked up which stays to the right hand side of the benleagh river and continues up and over Fraughan Glen. 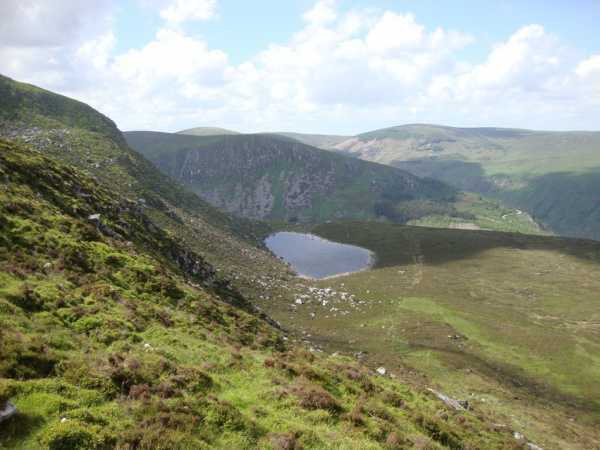 Spectacular views back down the glen and across to Lugduff can be enjoyed.